The American public may think of Russia as an ice-covered desert, but the country's economy has been heating up over the past several decades. Since the collapse of the Soviet Union, the country's economy has undergone significant free market reforms. And between 2000 and 2008, the country's nominal Gross Domestic Product (GDP) doubled, making it a very important emerging market economy. Despite this tremendous growth, Russia's economy is primarily commodity-driven and carries several risks for international investors. The lack of predictable tax and business legislation has been a significant barrier to private business and investment. At the same time, the collapse of crude oil and other commodities in 2015 and 2016 put downward pressure on the economy. 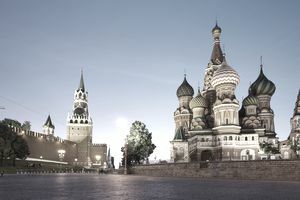 In this article, we will take a closer look at Russia's economy, benefits, and risks for investors, and the best ways to invest in the emerging market economy. Russia is best known among international investors for its energy industry, as a leading exporter of oil and natural gas. But, those investing in Russia are also watching its growing information technology (IT) and telecommunications sectors. In particular, the country's software industry is one of the fastest growing markets in the world. All emerging markets carry an element of risk. Russia's high growth rates may be a bullish sign to investors, but its checkered history makes it riskier than more developed markets. Still, it's hard for international investors to ignore one of the world's hottest commodity markets in the world. Rich in Natural Resources. Russia is the world's largest exporter of natural gas, as well as one of the world's largest oil and steel producers. Strong Emerging Industries. Certain niche industries, like information technology and telecommunications, have experienced significant growth. Growing Middle Class. Russia has an enormous population of 142 million citizens with personal incomes that are growing an estimated 10% to 15% each year. Lack of Regulation. Russia does not have many safeguards in place to protect investors, especially compared to the U.S. or free market orientated economy, it still faces a higher level of instability and risk than the U.S.
Reliance on Natural Resources. Russia is one of the world's largest energy exporters, which means that it's economy is reliant on energy prices. If energy prices take a downturn, it could negatively impact the economy, which happened throughout 2015 and 2016. There are many different ways to invest in Russia, ranging from U.S.-listed exchange-traded funds (ETFs) to securities listed on its own stock exchange, the RTS (Russian Trading System). ETFs represent the easiest way to gain exposure without worrying about the legal and tax implications of American Depository Receipts (ADRs) and domestic securities. International investors looking for direct exposure can purchase Russian securities directly using any global trading platform with access to the Russian RTS. The country's most popular stocks are listed on the RTS 50 index, which is the country's equivalent to the S&P 500 in the U.S.
Russia is one of the fastest growing emerging markets in the world and a member of the BRIC nations, but it also has many political and economic risks. Those looking for an easy way to invest in Russia should look at ETFs and ADRs, while those looking for more direct access may want to look at trading shares on the Russian RTS.